Addressing the relationship between drought and violence in Mali cannot rely on traditional crisis responses. By Jonathan Rozen and Gustavo de Carvalho for ISS TODAY. First published by ISS Today. Devastating drought combined with unpredictably heavy rains has wiped out agricultural livelihoods, and has also affected traditional herders in the north. As a result, pastoralists can’t feed their animals and are forced into the valleys where conflicts often arise with farmers over land and water. In response, efforts are under way to make these communities more resilient to worsening conditions and to prevent conflicts. Mali has been wracked by a civil conflict since rebel groups began a campaign to overthrow the government in 2012, but the growing violence between farmers and pastoralists has largely occurred separate from the national conflict. Against this backdrop of larger conflict, access to arms has amplified and made rural competition over resources increasingly violent. The United Nations (UN) estimates that 2.5-million Malians will face food insecurity, malnutrition and other consequences of conflict in 2016. Climate change continues to pose serious challenges to the achievement of the UN Sustainable Development Goals. In a November 2015 report, the World Bank warned that rapid and climate-informed action is necessary to stop over 100-million people from being pushed into poverty. But in Mali, climate change is already increasing conflict. In the same rural area of northern Mali’s Gao region lives Diallo Safiétou Touré, 40, president of the Collectif des Femmes du Mali – a collective that supports female farmers. She understands why herders come down to the farmlands, and has seen how the changes in weather patterns caused by climate change have killed the vegetation their animals need to survive. “It’s necessary for the pastoralists to move their animals” she told ISS Today. “It’s necessary that they come down to the fields, and that’s when there will be conflict … every morning there are conflicts.” Drought, however, is not the only climate condition contributing to instability. According to the Niger-based African Centre for Meteorological Application for Development, the rainy season of 2015, which stretches from July until September, was characterised by abnormal and above-average precipitation. Influenced by El Niño, this monsoon caused flooding of the Niger River, which runs alongside Ansongo. The UN Office for the Coordination of Humanitarian Affairs in Mali indicates that 14,000 Malians suffered sub-par crop yields as a result of the 2015 flooding, and that 61,000 Malians are at risk from flooding in 2016. Climate change has meant an increased frequency of drought cycles across the Sahel. Development organisations working in the region have noted that delayed or absent rains used to occur every five to seven years, but now it’s every two or three. The AU has also highlighted the implications of climate change in “undermining peace and increasing pressure on natural resources. But as the world experiences the warmest decade on record, the shock of extreme seasonal conditions disproportionately affects vulnerable populations. It decreases their resilience; the ability to maintain livelihoods and sustain peaceful social relations in the face of shocks like those posed by extreme weather. People working in peace-building, like those looking to help communities in Mali, increasingly work to support the capacity of vulnerable populations to face their day-to-day challenges. The less resilient populations are, the less capable they are to deal with the causes of conflicts. By proactively supporting Malians’ ability to peacefully respond to difficult conditions, conflicts may be prevented over the long term. Resilience-building efforts can involve various approaches and types of organisations, including the private sector. “It’s really [important] to better understand floods and how you can take more preventive measures … and how you can help [people] build resilience against these risks, so that you don’t have to pay out when [floods] happen,” says Linda Freiner, Flood Resilience Programme Manager at the Zurich Insurance Group. For companies like Zurich Insurance, there is a clear business rationale for building the resilience of Malian communities. Mercy Corps, an international development organisation, is also working to increase private sector activity in northern Mali. It focuses on helping people to access formal financial services, like credit options and mobile banking, so that they can better manage their funds and deal with disruptions to their livelihoods without having to resort to violence. Not all resilience-building initiatives are well suited to corporate partnerships. Groundswell International, an international development organisation focusing on rural communities, believes that farmers should be making better use of what they have, instead of buying new materials. For Ansongo agriculturalists, food insecurity is closely linked to access to water. “The [Niger] river plays a lot into cultivating … when rain is weaker the [cultivation] period is shorter because the water retracts faster,” said Salou Moussa Maïga, of the farming co-operative. Groundswell supports small-scale farmers in the Sahel by offering agricultural strategies that mitigate the impacts of climate change; notably desertification, higher temperatures and decreasing soil fertility. These “agro-ecology” practices improve water-holding capacity and resistance to erosion, resulting in improved grain and livestock production. This means adding knowledge to existing practices – not introducing external companies to offer services at a price. These strategies match the mission of Maïga’s agricultural co-operative, which aims to increase efficiency and productivity by showing people how to conserve resources. “We need to find a way to work with nature to bring back grass and to bring back water in the river,” he added. That resilience-building is becoming increasingly important in development and peace-building indicates a shift towards longer-term strategies. “Year after year, the international community pours in billions of dollars of humanitarian relief and response. But I think that people are starting to say, particularly in light of devastating droughts in Africa in 2011 and 2012, that we need to address these areas of chronic vulnerability,” said Thomas Beck, Director of the USAID Resilience Secretariat. For the Global Resilience Partnership, a collaborative endeavour of donors working to fund resilience building initiatives, the focus on resilience indicates a shift away from reactive pessimism and toward proactive optimism. This offers people the ability to manage their own affairs in the face of environmental, social or economic shocks. Beyond economic and social empowerment, this may also create the foundations needed for sustained peace and development. Options for addressing the relationship between drought and violence in Mali cannot rely on traditional crisis responses, and should consider the day-to-day realities of those most affected. Communities should be offered the tools and knowledge to respond to climate shocks and avoid violence; but beyond pragmatic resilience-building, conflict-prevention efforts must recognise the need for action on root causes. “We have to try to reduce the warming … the struggle against poverty … [and] overall reduce the degradation of the environment,” said Touré, from the Collectif des Femmes du Mali. Jonathan Rozen, Independent Researcher, Toronto, and Gustavo de Carvalho, Senior Researcher, Peace Operations and Peacebuilding Division, ISS Pretoria. 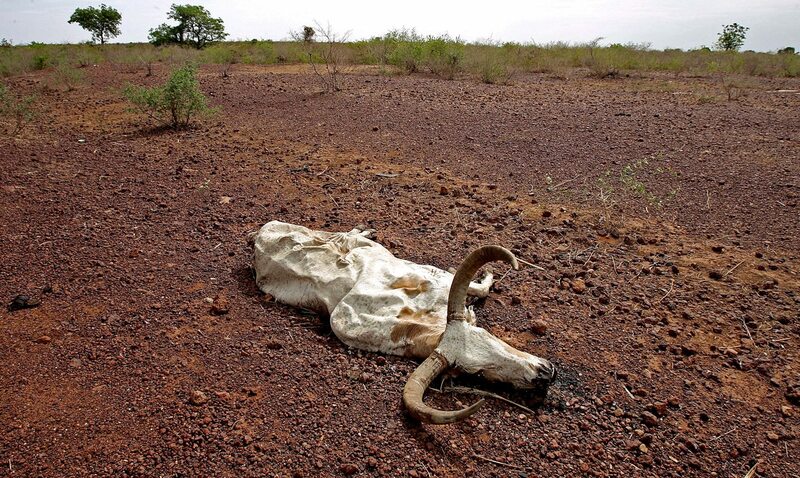 Photo: A file picture dated 01 May 2007 shows a dead bull on a dry plain in central Mali. EPA/NIC BOTHMA.